This beautiful Clivia Lilly surprised us completely when it appeared from a clump of nondescript, strapy leaves last spring. Clivia is an old fashioned favourite that is fast coming back to suburban gardens with the many new species now on sale in Garden Centres. This particular plant is now being shared with friends and family as it is a wonderfully hardy filler for those difficult, shady spots in the garden where little else will thrive. In fact it hates the sunlight, the leaves turning a sickly yellow when exposed too much. Even then it will still struggle on and flower despite it all. 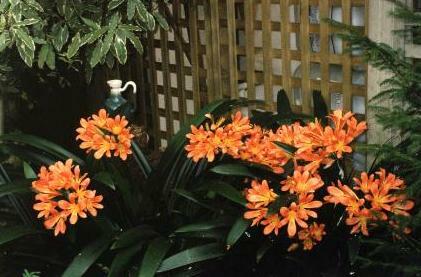 It turns the pools of deep shade, under trees and in ferneries, sunny with its large, bright, apricot/orange flowers. This was not a plant that we were familier with until last springs flowering. Now it has become one of my favourites and will no doubt be joined very soon by some of its newer cousins.